A week of records in the markets could end with a whimper, with investor sentiment struggling to recover after taking a big hit Wednesday. Declining Treasury yields, disappointing quarterly earnings from Wal-Mart (WMT) and a broad sense of fear in the markets has contributed to pushing stocks down. U.S. stock futures were dipping lower Friday. The major indexes are just below their closing levels from a week ago, a dramatic turnaround from Tuesday when they were hitting new record highs. Wall Street is now waiting for the U.S. government to publish housing starts and building permit numbers from April at 8:30 a.m. ET. The monthly Michigan Consumer Sentiment Index comes out at 9:55 a.m. ET. The main premarket mover Friday is J.C. Penney. (JCP) Shares are soaring by roughly 20% ahead of the opening bell after the company posted quarterly sales that beat expectations and revealed a smaller-than-expected loss. Nordstrom (JWN) shares also rose in extended trading after the company posted earnings that beat analysts' expectations. Shares in Verizon (VZ) are rising by about 2% after Warren Buffett's investment firm, Berkshire Hathaway (BRKA), revealed it had purchased a stake worth nearly $530 million in the company. U.S. stocks fell hard Thursday. 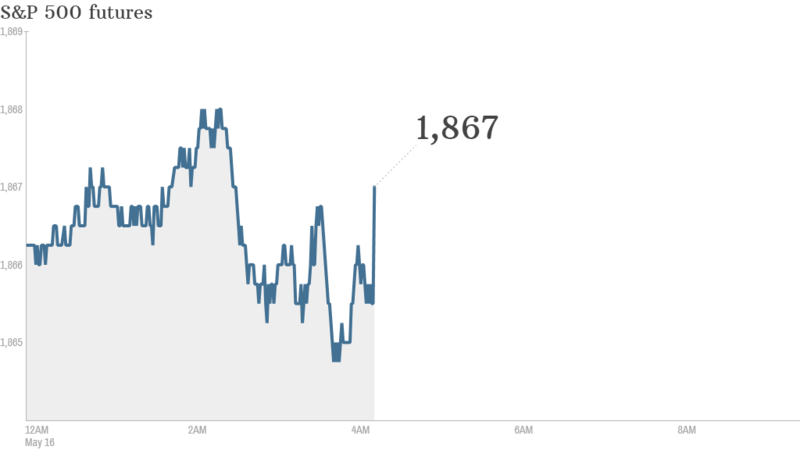 The Dow Jones industrial average ended the day down nearly 170 points. The S&P 500 fell nearly 1% and the Nasdaq closed down 0.76%. Indian markets were shining amid the broader gloom. The benchmark index surged to a record high as early election results suggested a sweeping victory for Narendra Modi and the pro-business Bharatiya Janata Party. Other Asian markets ended with mixed results, while European markets were relatively flat in morning trading.